Can you believe how fast 2018 passed? As we reach the end, we enjoy looking back at the ending year and checking out which were the most popular articles/posts of the year, finding which ones were useful, got lots of comments but also checking out where we saw there were holes to fill in terms of information and creating new articles with information to help plan your time in Florence and Tuscany. From what has been popular – and useful – we hope to offer both a year in review as well as a jump start for anyone who is starting to plan a trip to Florence over the next few months or the year. We’ve started seeing posts on our Forum about upcoming trips with questions on itineraries popping up, so hope these can provide an additional source of information as you plan those itineraries. Enjoy! We had recommendations for 3 days in Florence and 2 days in Florence but not yet what to do in just 24 hours – so we finally filled the void and offer our suggestions for those that want to visit Florence and see the main sights but can’t stay longer. While it was always possible to pick and choose from the longer lists, these are the ones we definitely suggest are a must and which you cannot miss on a short visit to the city. If you do have a little more time, however, we highly recommend you spend more time to explore the sights without being in a hurry. Come Spring and Summer, spending time outdoors is a must! While the center of Florence might feel like it is made of stone with so many palaces and piazzas covered in it, know that around a corner you might find a secret neighborhood garden behind a wall! We have gone across the city ourselves and collected information on the main parks and playgrounds we recommend you enjoy with or without kids when the weather is warm and sunny, to enjoy another aspect of Florence. This is a top article on our site as many people seek to identify the places that can be visited without spending too much… particularly interesting to note which top sights are free that need to be included in your itinerary and not ignored because they are not a museum or special attraction! Lots of families visit the city and ask us about what to do with them so that they don’t go into overload. Depending on age, some kids might not appreciate spending all of their time at the main museums, but there are ways to visit with them (think of making it a treasure hunt!) and then there are also museums that have done a great job at creating special itineraries for families, thinking of how to present their collections to make them interesting and fun for kids. Check these out, especially the Stibbert pictured above if your kids are into armor and knights! We are often asked what you can buy while in Florence that is “typical” of the city and unique to take back home to family and friends, but also as your own keepsake of your trip. While our top gift recommendations include gold and leather, marbled paper is also a pretty unique product in Florence. This year we particularly enjoyed making our own, which you can see in the photo above. 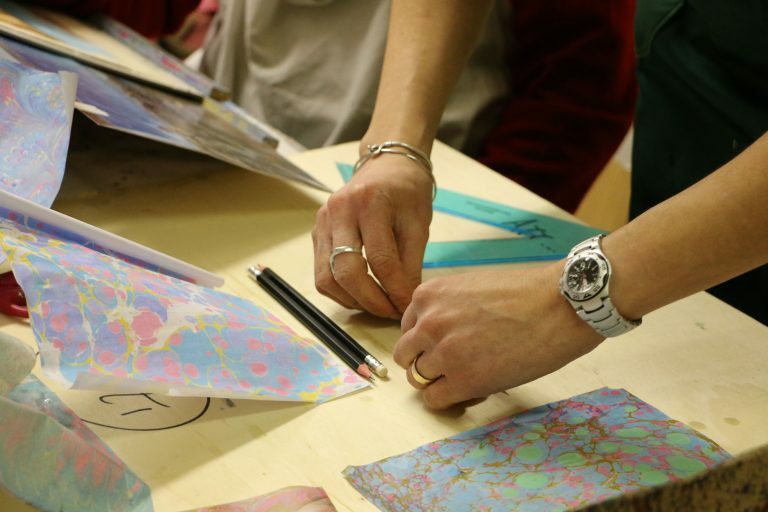 If you want a special “artistic” experience where you can let yourself be creative – and especially if you have kids – how about trying your hand at learning how to make it? Read about our experience here. If you don’t want to drive while in Italy, then Florence makes a great base from which you can use trains and buses to get around. Here are the top day trips you can take which will include the main highlights in Tuscany. It takes time to visit the Uffizi Gallery and if your time is limited, one of the best ways is to visit with a guide! Not only is this person an expert in art, he or she will take you to the main rooms and make sure you don’t miss any of the most important works of art, all in less than 2 hours! You will feel like you have learned interesting information of the works as well as their history, all while having a fun visit. We tried out this tour to give our review so that you know what we liked and found the most interesting. If you want a panoramic view of Florence and visit archeological treasures from the Etruscan period, Fiesole is a must! Aside from the view, make sure to visit the main sights in Fiesole by following our recommendations. As soon as the temperatures start warming up, even visitors in the center of the city like to cool down at a pool and not all hotels have the space for them (although there are several with rooftop ones 😉 ). Here is the list of top pools open to the general public where you can enjoy a fresh dip to cool down, especially if you’re here in July or August. Don’t forget to check out our TOP lists for accommodation by theme, from romantic to budget, from family-friendly to luxurious places. Those provide recommendations on where to start looking and are a favorite among our readers :).